Concrete is a building material made from a mixture of 3 basic components: broken stone or gravel, cement, and water. The mixture can be spread or poured into a mould. The use of concrete goes back a thousands years. It was widely used during the Roman Empire. During the Roman Architectural Revolution the constructors got free from the restrictions of stone and brick, which allowed them to make new designs in terms of structure and dimension. The Colosseum in Rome has a big concrete structure. The concrete dome of the Pantheon is the world's largest unreinforced concrete dome. . 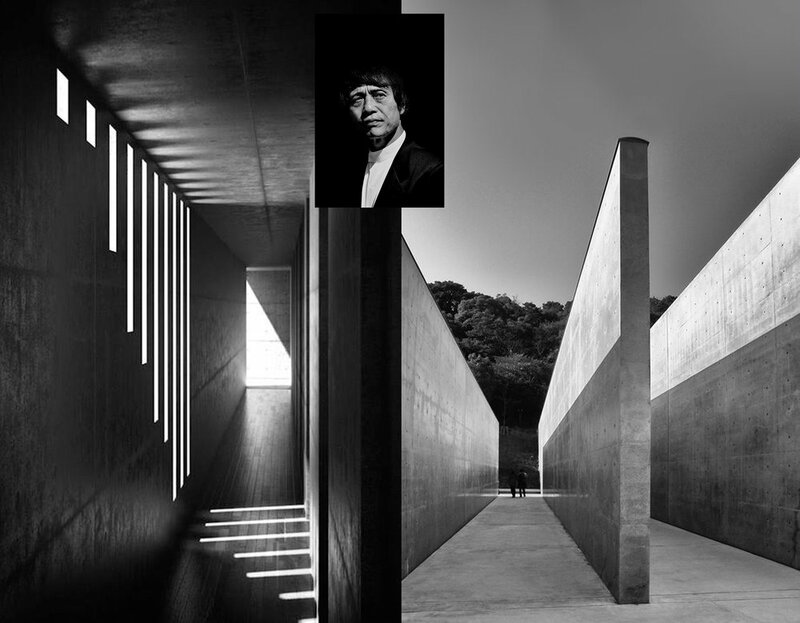 When I think of concrete than I have to think of Tadao Ando, the Japanese self-taught architect. His work, primarily in reinforced concrete, defines spaces in a new ways. He plays with the light in a unique way: his structures are allowing a constant changing pattern of light. His concrete is often referred to as "smooth-as-silk". Tadao Ando explains that the quality of the construction doesn't depend on the mix itself, but rather on the form work into which the concrete is cast. The craft level of carpentry is very high in Japan thanks to the tradition of wooden architecture. Holes and cracks in the surface can appear in the concrete when a single drop of water will escape from the seams of the wooden forms, so watertight forms are essential for the quality of the final product. The form moulds of Tadao Ando are even finished, this is his secret to achieve this smooth-as-silk finish. The evenly spaced holes in the concrete, Tadao Ando's signature, are the result of bolts that hold the form moulds together. Tadao Ando's concrete is both structure and surface, never camouflaged with plaster or other wall finishings. He was raised in Japan where the religion and style of life strongly influenced his architecture and design. His architectural style is emphasizing nothingness and empty space to represent the beauty of simplicity. He uses the natural light and the structure in a creative way, one that follows natural forms of the landscape, rather than disturbing the landscape. Working with concrete on big surfaces is not always easy. The Romans knew that adding horse hair made concrete less liable to crack while it hardened, and adding blood make it more frost resistant. The first three days are critical during the hardening and hydration process. Fast drying can result in shrinkage, not gaining sufficient strength, resulting in greater shrinkage cracking. You can increase the strength of the concrete by keeping it damp during the curing process. Concrete is one of the most durable building materials, and gains strength over time. Concrete is used more than any other manmade material in the world. What about using concrete in your home other than for structural purposes? Why not using it in kitchen or bathroom? Using concrete for a countertop has quite some advantages. You can use it in its natural grey color, but it has unlimited color options, so this gives you the ability to match the countertop with other colors in the room. In its natural state, concrete is porous and may stain. Once sealed it is stain and water resistant. Concrete can be cast in any shape and practically any size. It will evolve and acquire character over time, developing a warm patina. Replace your tiles in the bathroom with concrete for a seamless and modern look. Some benefits of using concrete in your bathroom: a solid surface which stands for durability, and easy care. Its customizable nature allows you to shape it to form tubs, integral sinks, and to use it every day worry-free. A mild soap and warm water is all you need for daily cleaning, and a reapplying a wax to the surface of the countertop once every month. You think concrete looks cold? Not when you combine it with natural wood, a perfect match. Concrete exist for thousands of years, but it still inspires creative people. Translucent concrete has been developed by Hungarian architect Aron Losonczi in 2001. When backlit, a human form can been seen through the wall. The translucent blocks are made by mixing glass fibers into the combination of crushed stone, cement and water. The patent protected Litracon® products presents a wide range of new building materials. Producers of ceramic tiles also started to develop products inspired by concrete, for those who love the look but are afraid of using the real material in their home. People would say dust could be one of the reasons not to use it, once sealed there is no worry about the dust. As being trendy as a material more people are studying the use of color, and the different finishes to make it even more interesting. Concrete tiles are quite trendy these days, in as well residential projects as in restaurants and bars. They are versatile, budget friendly, custom made for your application, and a very good alternative for the classical ceramic tiles. I will come back soon with another blogpost telling more about those tiles which fit in modern as well as classical interior. Shmuel Linski started working with concrete during his studies at the College of Engineering and Design. Espresso Solo, the conceptual product features metal working parts in a concrete cast. He wanted to show that concrete which was already used on big scale in the kitchen could also be used for a desirable consumer product such as a coffee machine. And the machine is working with coffee beans, so no extra waist which is another advantage. When we think of buying kitchen accessories we most of the time think of ceramic, glass. Did you ever consider buying items in concrete? They are simple and look great in the kitchen, bathroom, or even on the dining table. Perfect for a modern home, the minimalist will love it too. Industrial inspiration for concrete light fixtures, they look really cool in modern home, not only in a loft decorated in industrial style. They are very trendy so you will find them in local design shops, and if no trendy design shop in your area than you will find them on-line and delivered at your door. The beauty here is in the details: take a close look to the electrical cable which wrapped in colored textile. Pure lines, a touch of humor. Or you prefer the rougher touch of showing the metal structure? Concrete is cold, masculin? No, concrete can be very colorful, joyful, feminine and even romantic. Rethink the classical idea of a vase as a symbol which is part of a composition showing the beauty of nature. The contrast of the heaviness of the concrete bottom with the light metal frame on top, adding some color and you have a new concept for a lovely interpretation of a classical vase. Urban jewelry in concrete: handmade, poetry in the imperfections, for the romantic women with a "hidden" love for industrial style. You can wear those concrete necklaces to highlight a simple but elegant dress, paired with a jeans of more daring with a femine evening dress. Combining classical design with a more edgy material. You still think concrete is a grey and cold matter? Hope you got inspired, wish you a creative week.